A special event hosted by Ruth Davidson MSP and Johann Lamont MSP at the Scottish Parliament brought together MSPs from all parties who pledged to remember the victims of genocide in Bosnia-Herzegovina and bring communities in Scotland together to tackle hatred. Yesterday’s White Armband Day marked the 25th anniversary of the decree being issued by Bosnian Serb authorities in Prijedor that non-Serbs must mark their houses with white flags or bedsheets and wear white armbands when leaving the house. Just over 50 years after the Nazi decree that required Jews to wear a yellow Star of David to segregate them from the non-Jewish population, once again members of an ethnic or religious group were marked for extermination. Ruth Davidson MSP explained why it was important to hold this event: “I became involved with Remembering Srebrenica after travelling to Bosnia with them to meet genocide survivors and relatives of those who died. They want to share their stories because the lessons of what happened there are still so relevant today and can be used in tackling the problems in other countries. Johann Lamont MSP added: “Genocide is a gradual process, the seeds of which are sown when social and cultural differences are not celebrated, but used as reasons to exclude or marginalise. To think that, only 25 years ago, people were being marked for extermination in the heart of Europe purely on the grounds of their faith just 50 years after The Holocaust is horrendous. 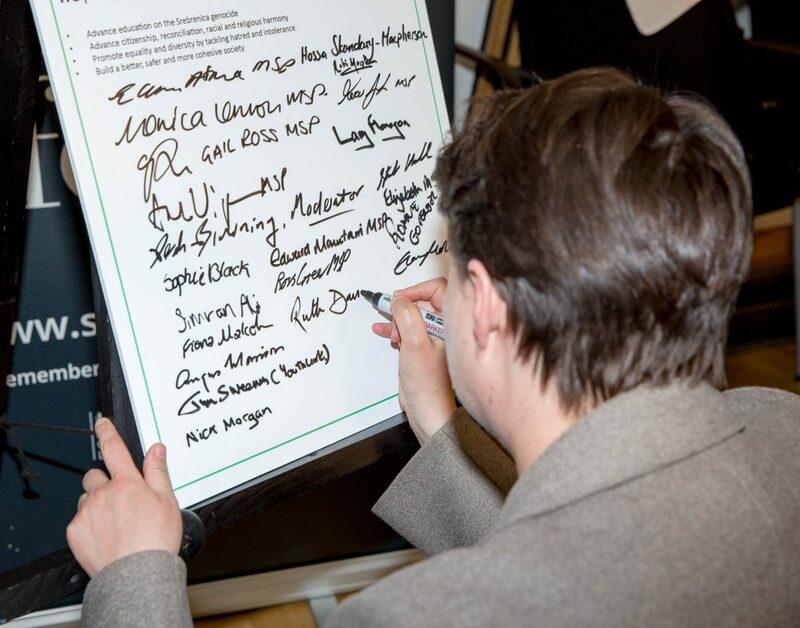 MSPs attending the event all signed a pledge to honour the victims of genocide in Bosnia-Herzegovina and promote Remembering Srebrenica’s education pack, which has been tailored by the Scottish Government to the requirements of the Curriculum for Excellence. This resource is designed to raise awareness of the potential for ethnic tensions to escalate into violence and promote learning of the lessons from the past. White Armband Day is marked by Bosnian communities across the world on 31st May, not only to remember the victims, but also to raise awareness of continuing human rights violations taking place in the area today. 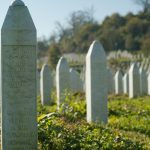 To this day, local authorities in Prijedor have refused to permit the construction of a memorial for the innocent civilian victims killed in the notorious concentration camp at Omarska or a memorial to the children that were killed in the war. Remembering Srebrenica Scotland Secretary and Treasurer, David Hamilton, was also representing the charity at an event at the Institute of Foreign Affairs in Stockhom, Sweden on 31st May.